Highly acclaimed for its long lasting magnetic power, our Permanent Magnetic Drums are an integral part of processing drums. 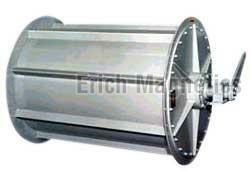 We are a well-known Manufacturer, Supplier and Exporter of Permanent Magnetic Drums from Delhi. Erich Permanent Magnetic Drum Type Separator is most useful for separating tramp iron from non-magnetic material possessed in bulk quantity, for the purity of end products, recovery of metal having commercial value and protection of processing plant and machinery. Buyers are free to place bulk orders of the Magnetic Drums with us and expect their timely delivery. These drums are widely used in all processing industry for separation of iron contamination from minerals, chemicals, food, flour, plastics, grains, sand, cement, fertilizers, abrasives, glass, slag, ores, rock, refractory and many other products. Our drums are available in diameters ranging from 200 to 1000mm and length from 200 to 2000mm. Our drums are made using permanent magnets, which are long lasting in quality and ensure longer functional life. The power of these permanent magnets does not reduce during normal use. Volume of material that can be handled by these drums depends up on the diameter and length of the drum.